5298 ✉ 3I,5I 10 Pfg. And 25 Pfg. 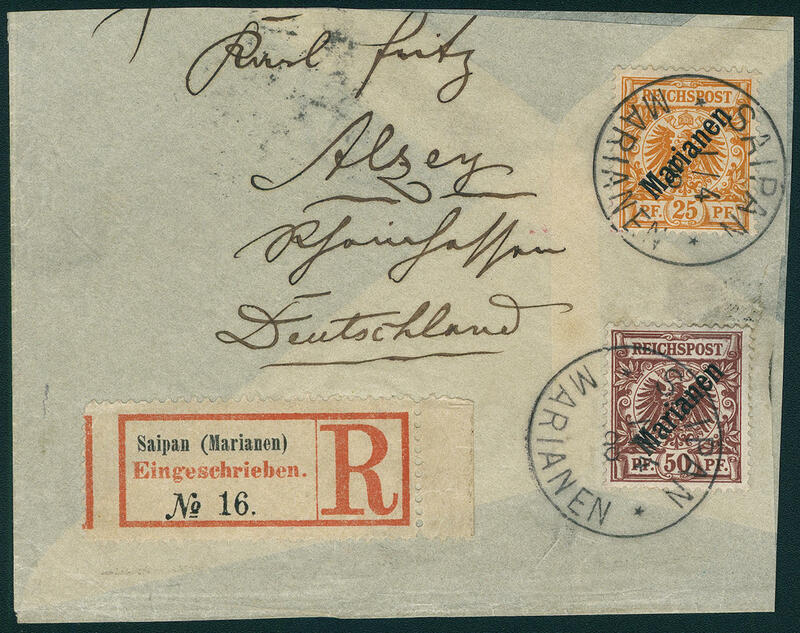 Diagonally overprint, both values wonderful fresh colors and faultless perforated on very nice registered cover with clear single circle postmark \"SAIPAN the Mariana Islands 19.4.01. 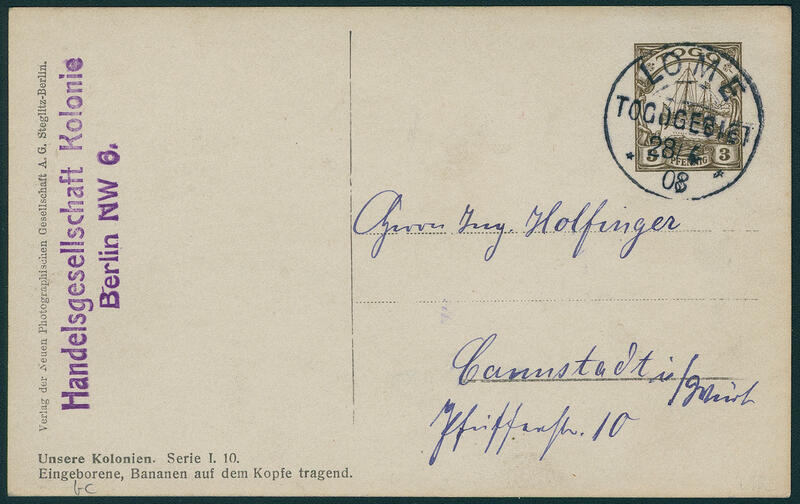 \" to Saxon mountain with arrival postmark. An especially attractive and rare cover! Expertized Friedemann, Grobe, photo expertize \"genuine and immaculate\" Eichele. Michel 8240,- €. 5299 ∆ 5/6I 25 Pfg. Yellowish orange and 50 Pfg. 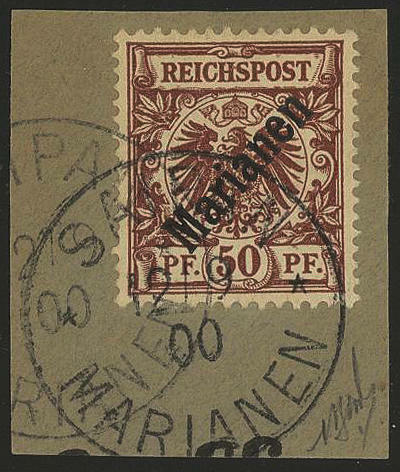 Bright red brown, diagonally overprint, both values wonderful fresh colors and in perfect condition on decorative letter piece with appropriate registration label, used in the correct time before the stamps were demonetized with two clearly single circle postmark \"SAIPAN the Mariana Islands 1.4.00. \". An attractive and scarce common use the both key values of this area! Photo expertize \"faultless condition\" Jäschke-Lantelme BPP. 5300 5I 25 Pfg. Yellowish orange, diagonally overprint, wonderful fresh colors and very well perforated, in perfect condition unused with original gumming, nearly mint never hinged causing. An outstanding quality this colonial rarity! Photo expertize \"faultless condition\" Jäschke-Lantelme BPP. 5301 ⊙ 5I 25 Pfg. 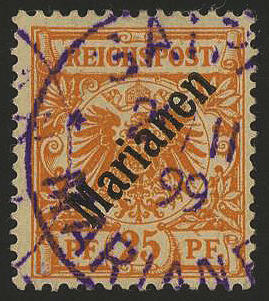 Yellowish orange, diagonally overprint, fresh colors and in perfect condition, clean on self-formed pages with rich in contrast violet single circle postmark \"SAIPAN 29.11.99. \". A very nice copy this colonial rarity! Photo expertize \"faultless condition\" Jäschke-Lantelme BPP. 5302 ∆ 5I 25 Pfg. 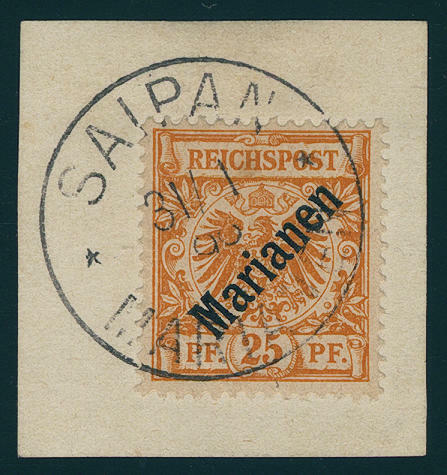 Yellowish orange, diagonally overprint, fresh colors and well perforated on magnificent white letter piece with clear single circle postmark \"SAIPAN 31.1.00. \" (type II) in utterly perfect quality. Photo expertize \"faultless condition\" Jäschke-Lantelme BPP. 5303 5IIK 25 Pfg. Orange with inverted steep overprint, wonderful fresh colors, normal perforated, in perfect condition unused with original gumming. From this spectacular variety existed only a sheet. A rarity of this area! Photo expertize \"faultless condition\" Jäschke-Lantelme BPP. 5304 ∆ 6I 50 Pfg. Bright red brown, diagonally overprint, wonderful fresh colors and well perforated on very nice letter piece, clean and on self-formed pages \"SAIPAN the Mariana Islands 12.9.00. \". An outstanding quality this colonial rarity! Photo expertize \"faultless condition\" Jäschke-Lantelme BPP. 5305 ∆ 6I 50 Pfg. 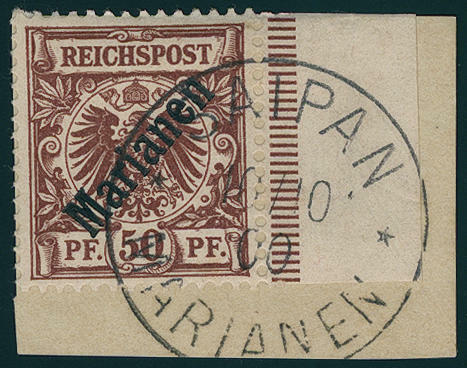 Bright red brown, diagonally overprint, from right margin of sheet, fresh colors and well perforated on very nice letter piece with clear date-appropriate stamp \"SAIPAN the Mariana Islands 10.10.00. \". An outstanding quality this colonial rarity! Photo expertize \"genuine and immaculate\" Eichele. 5340 ⊙ 9IAbart 80 Pfg. Dark reddish carmine / red black on pale carmine, spacing of lines 3 mm, extremely rare overprint varity \"wide TOGO\", wonderful fresh colors, very well perforated and especially clear centric cancellation \"LOME 7.12.14\". 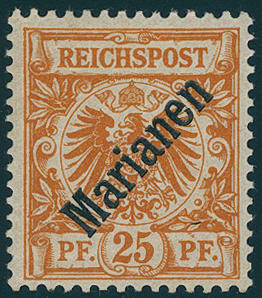 The edition this overprint varity amounts only 11 pieces. A rarity of the British occupation! Photo expertize Royal Philatelic Society / London. 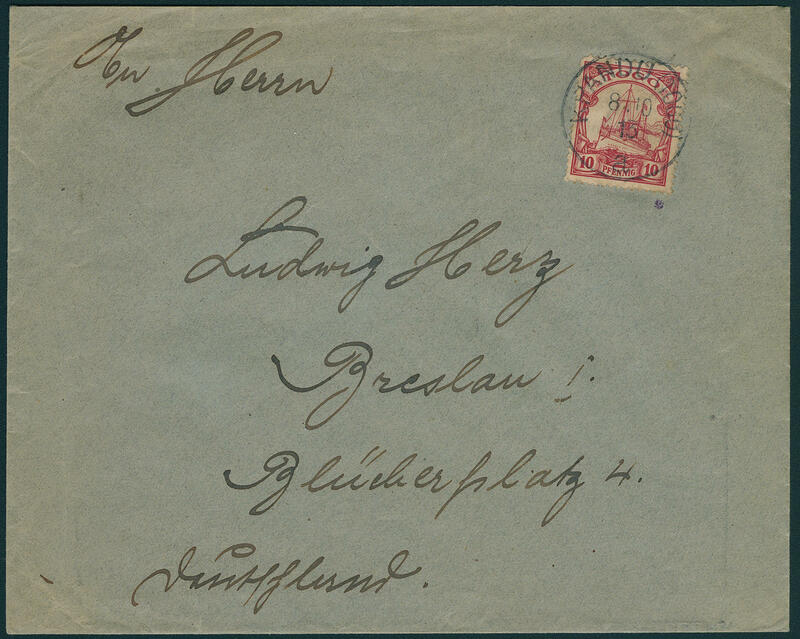 5341 ✉ 2 P. Red-brown, postal stationery cover in the rare size 134:82 mm (issued only 240 piece! ) with two ring cancel \"TSEWIE 26. 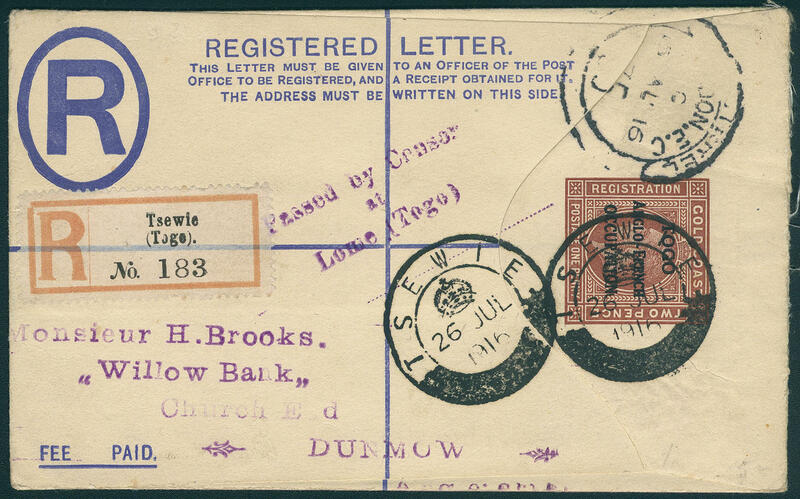 July 1916\" and cancellation adjusted registration label, as well three line censorship stamp from Lome to Dunmow / England. Very rare! 5328 ✉ 48d 20 Pfg. Violet ultramarine on very nice cover with centered turning into station stamp \"station MISAHÖHE Togo territory 6.7.94\" and additional single circle postmark \"LOME Togo territory 21.7.94\" to Germany, there forwarded with transit and arrival postmarks. 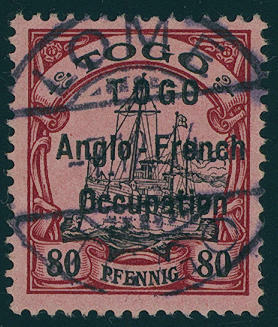 A cancellation by the station stamp was irregular. The frank the mailings and whose cancellation was only the postal service institutes on shore Reserve. An extraordinarily nice and very rare cover! Photo expertize Steuer BPP. 5334 ∆ PP 3 Pfg. Ships, privat postal stationery \"our colonies, set I. 10. Indigenous woman, bananas on the KOPFE carrying\", in perfect condition from \"LOME 28.4.08\" to Cannstadt. Rare! 5343 ✉ 5 Pfg. 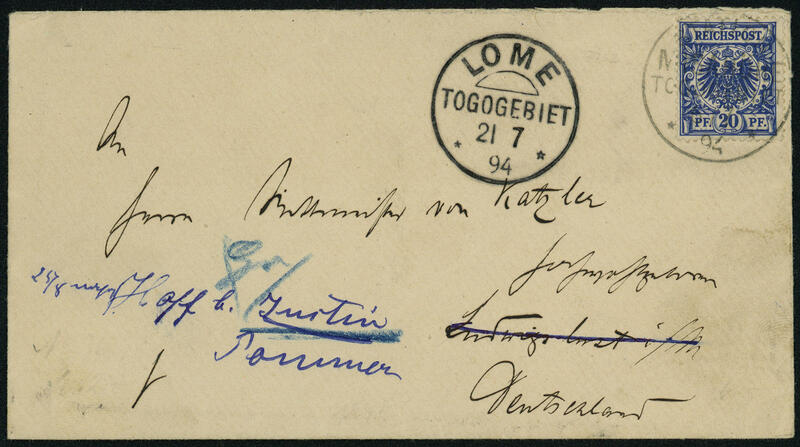 Germania, Reichspost, reply postal stationery with two clearly postmarks \"LOME Togo territory 23.3.02. 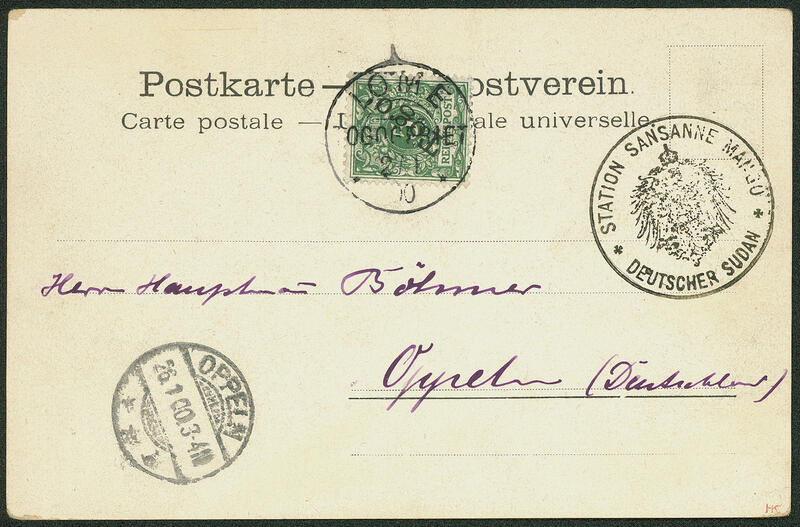 \" with detailed text to Gustavsburg with arrival postmark. 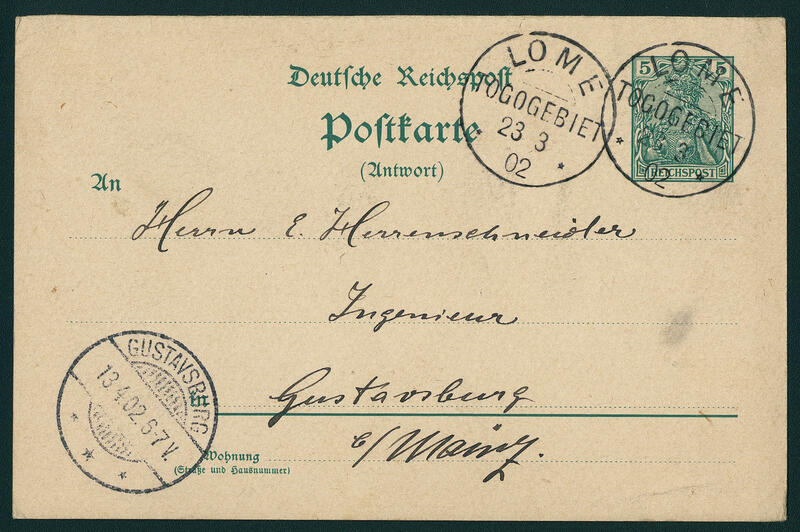 Returned reply cards from the German Reich are very rare! 5336 ∆ \"KPANDU 19.10.07\", centric and razor-sharp on faultless letter piece with 5 Pfg. Ships. 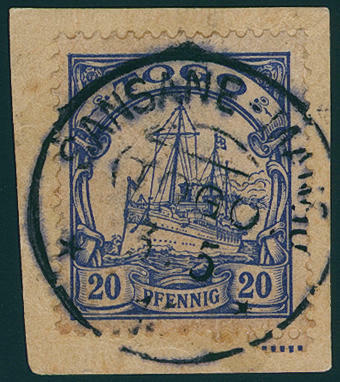 A rare stamp in exception-quality! 5337 ✉ \"KPANDU a 8.10.13\", perfect centric and razor-sharp, turning into on attractive, commercially used cover with 10 Pfg. Ships unwatermarked, small faults, to Wroclaw. 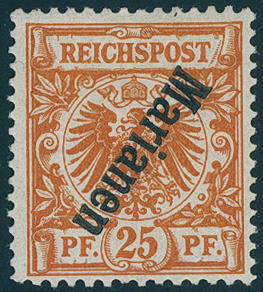 Covers with this stamp to class among the all large rarities of the German colonies. There are very few examples have become known. Due to missing offers also in the cancel catalogue the working group only with collector's price listed! Photo expertize Bothe BPP. 5338 ∆ \"SANSANE-MANGU 3.5.14\", centric and clear on commercial letter piece with 20 Pfg. Ships. An exceptional clear strike this very rarely cancellation! Photo expertize Steuer BPP. 5339 ✉ \"station SANSANNE MANGU German SUDAN\", clear seal stamp on nice picture postcard \"greatings from TOGO\" with 5 Pfg. 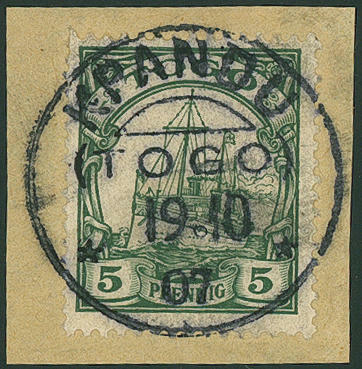 Bluish green, these at the parent post office tied by single circle postmark \"LOME 2.1.00\" to Opole with arrival postmark. Very decorative and rare! Expertized Bothe BPP. 5335 ✉ Bay.97Ia Bavaria, 20 Pfg. 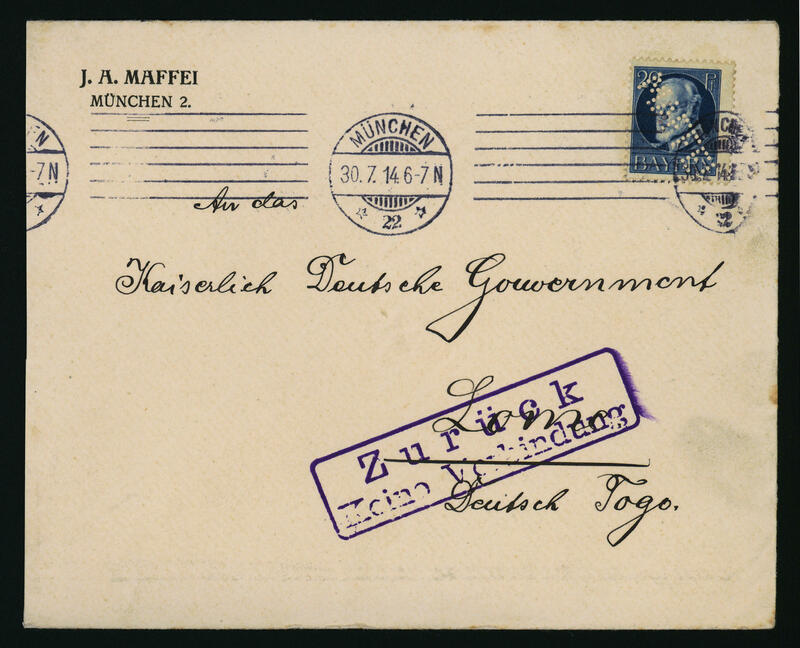 Luitpold with Perfin \"MAFFEI\" from \"Munich 30.7.14\" to the imperial German administrative district Lomé German Togo with violet box cancel of 2 lines \"return no link up\". An extraordinarily rare cover from the early days of the I. World war. 5342 ✉ \"ANECHO TOGO 20.3.15. 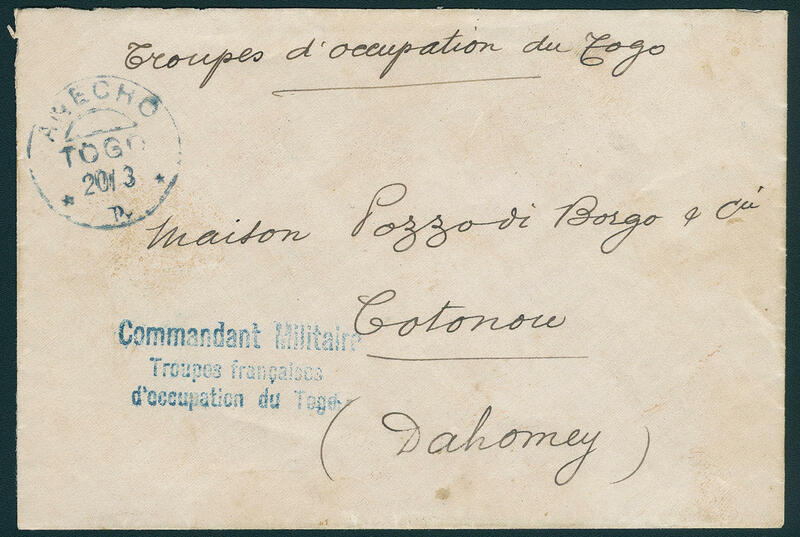 \" with provisional year date, neat stamp in blue-grey with additional three-line cancel \"COMMANDANT MILITAIRE TROUPS FRANCAISES D´OCCUPATION you TOGO\" on very nice military letter to Cotonou with transit and arrival postmarks. A very rare commercial letter! Expertized Bothe BPP, photo expertize Eichele. 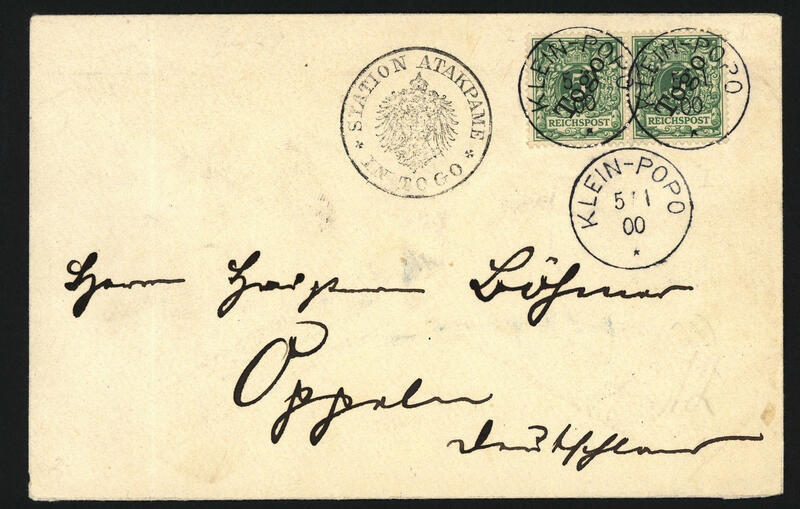 5329 ✉ 2 5 Pfg., faultless horizontal pair on very nice folded cover, correctly franked with pricked clear seal of office \"station ATAKPAME IN TOGO\" and clearly postmarks the parent postal service institute \"small bum 5.1.00\" to Opole with arrival postmarks. Covers with the seal from Atakpame are extraordinarily rare!